warm-up to Sunset Shuffle, 2010. 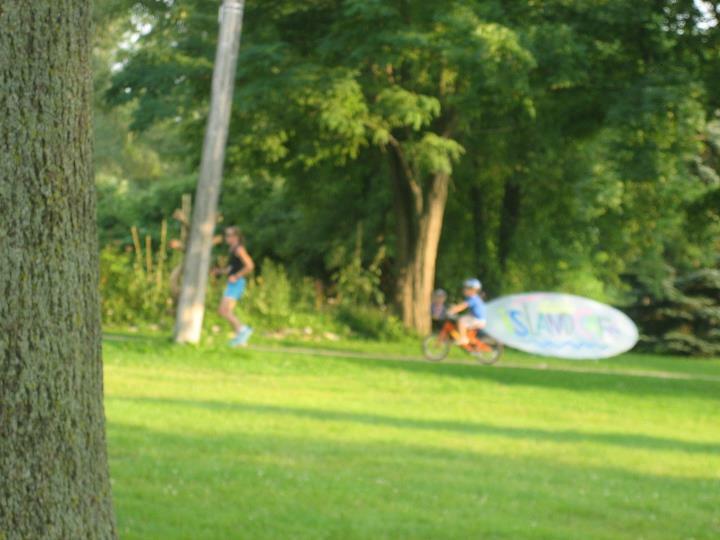 A few years ago, while warming up for the Sunset Shuffle 6K on Ward Island in Toronto, Little Ironman followed me on his bike. I love this picture of the two of us, especially since the sign behind him looks like a giant gas bubble. LI is a complicated 7 year old. He is a select mute, which is a condition rather than a disease or disability. Basically, he is mute when he wants to be. Around teachers, adults and in unfamiliar settings, expressing himself is very difficult. In the comfort of his home, we can hear him loud and clear; the only way I know he is asleep is that he has stopped talking. Select mutism often comes across as being shy, cute, and well-behaved, but when LI hesitates to speak around his grandparents and relatives, it is obvious that there is more to him than just being shy. In time, he will gradually outgrow this. When he is around my running friends, LI whispers to me what he wants to say and asks me to repeat it to them. Last weekend, after Dawn at the Don race in Toronto, Chad (one of our club’s speedy college runners), LI and I walked back to the car (about 2k), where we met Dave, Skipper, Kevin and Michael (both have known LI for a long time). For some reason, though, he instantly warmed up to Chad. Dave and Skipper were going to take LI while Chad and I ran through Sunnybrook Park. I think these were the first words that Coach and Michael had ever heard LI say, and I have never heard him speak loudly in any public setting. It was hard not to burst out laughing and proudly smile at LI’s sudden need to voice his thoughts. Completely unaware of what was going on, Chad created more than a giant bubble; he brought out a new level in LI’s communication.